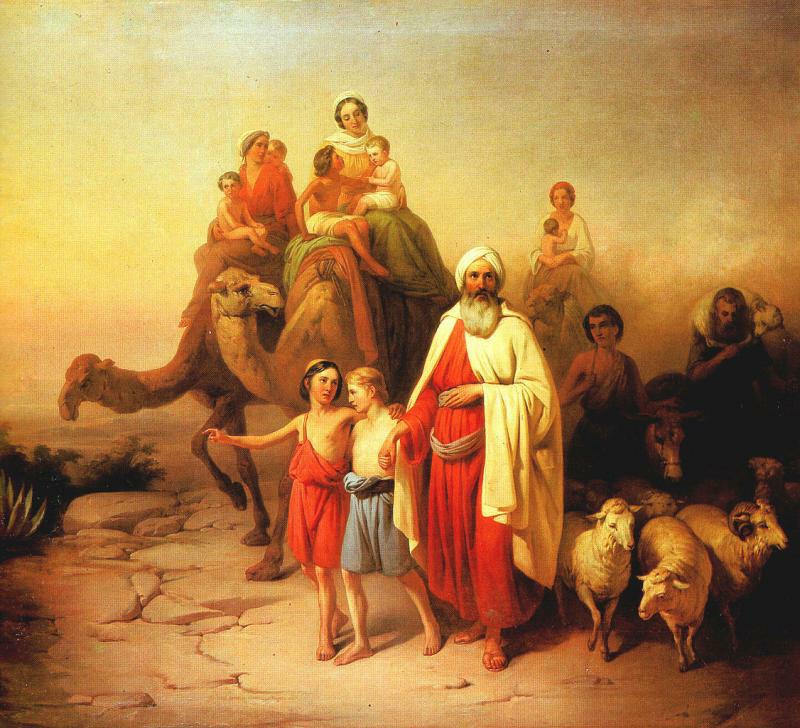 The patriarch Abraham pitched his tent and dug a well at Beersheba, a wilderness location identified in the Scriptures as the southern limit of the Promised Land. More than 1000 years before Christ, God had called Abraham, originally from Mesopotamia, to leave his family and possessions and journey to a new land — with the promise that his descendants would become a great nation. 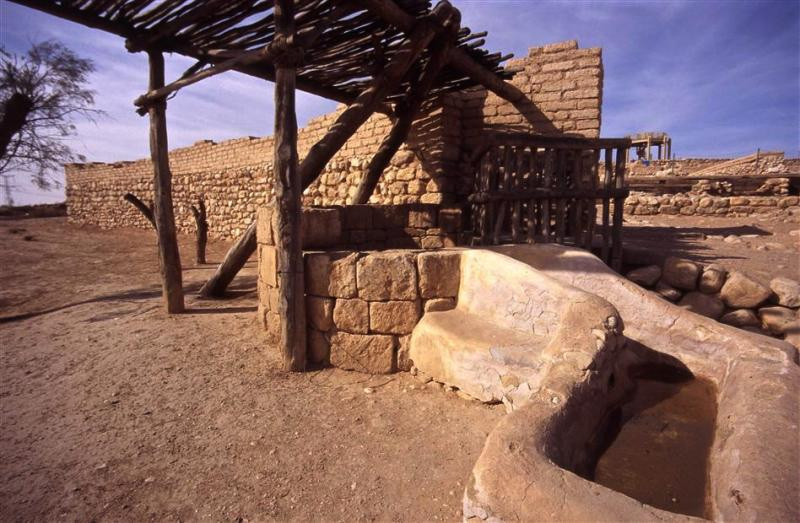 At Beersheba Abraham’s well, on which he depended to water his flocks, was seized by servants of the king of the Philistines, Abimelech. Whenever the writers of Scripture wanted to speak of all Israel from north to south, they would use the expression “from Dan [the northern-most city] to Beersheba” (for example, 1 Samuel 3:20). 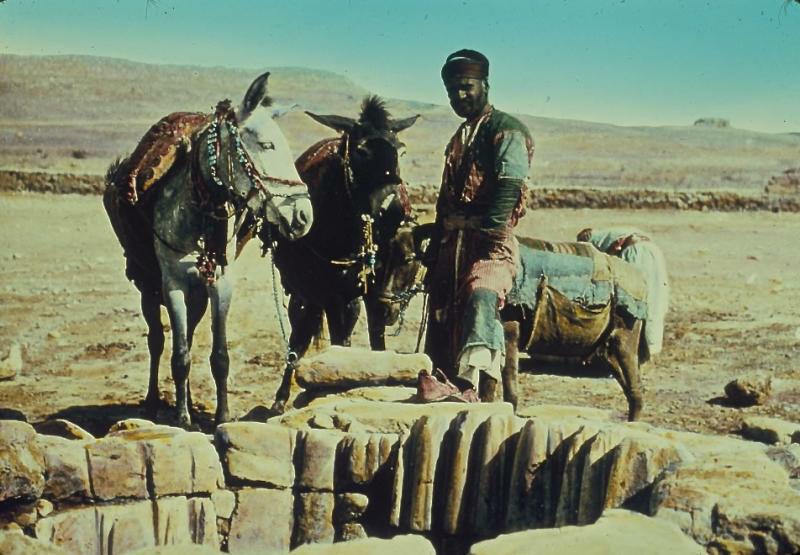 Of the several wells in and around Beersheba, one known as Abraham’s Well is on the southern edge of the old town, where Ha’azmaut Street joins Hebron Road. It is 26 metres deep. Nearby is the site of a colourful Bedouin market that has operated each Thursday since 1905. 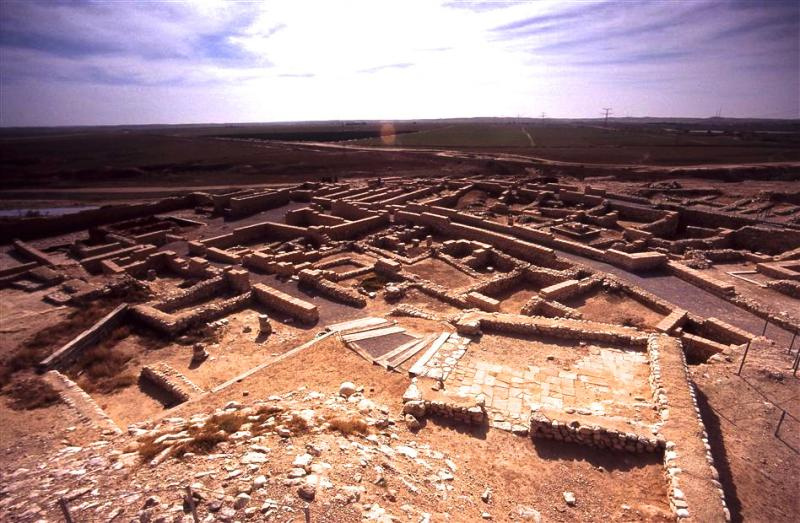 But the ancient settlement from biblical times was located at Tel Beersheba, some 4 kilometres east of the city, on highway 60. This World Heritage Site also contains a well — dated to the 12th century BC, the time of the patriarchs, and an impressive 69 metres deep — just outside the city gate. Archaeological excavations have uncovered public buildings, private houses, stables, and a large and impressive water system and reservoir. Extensive reconstruction in mudbrick has been done. Also on display is a replica of a horned altar, whose hewn stones were found reused on the site. It obviously belonging to an unlawful cult, because it does not comply with the law that an altar should be of “stones on which you have not used an iron tool” (Deuteronomy 27:5). The altar was probably one of those broken up during the religious reforms of King Josiah (2 Kings 23:8). The burgeoning modern city of Beersheba is peopled largely by Jewish immigrants from the former Soviet Union, Ethiopia and other countries. But the past is always present: Redevelopment of the bus station in 2012 uncovered remains of a Byzantine city, including two well-preserved churches. The Tombs of the Patriarchs in the West Bank city of Hebron is the burial place of three biblical couples — Abraham and Sarah, Isaac and Rebekah, and Jacob and Leah. The second holiest site in Judaism (after the Western Wall in Jerusalem), it is also sacred to the other two Abrahamic faiths, Christianity and Islam. It was the patriarch Abraham who bought the property when his wife Sarah died, around 2000 years before Christ was born. Genesis 23 tells how Abraham, then living nearby at Mamre, bought the land containing the Cave of Machpelah to use as a burial place. He paid Ephron the Hittite the full market price — 400 shekels of silver. Today the site is the dominant feature of central Hebron, thanks to the fortress-like wall Herod the Great built around it in the same style of ashlar masonry that he used for the Temple Mount enclosure in Jerusalem. Herod left the interior open to the sky. The ruins of a Byzantine church built inside the wall around 570 were converted by Muslims into a mosque in the 7th century, rebuilt as a church by the Crusaders in the 12th century, then reconverted into a mosque by the sultan Saladin later in the same century. Most of the enclosure is now roofed. Inside, six cenotaphs covered with decorated tapestries represent the tombs of the patriarchs. The actual burial places of Abraham, Sarah, Isaac, Rebekah, Jacob and Leah are in the cave beneath, to which access is not permitted. Set in the Judean Mountains about 30 kilometres south of Jerusalem, Hebron stands 930 metres above sea level, making it the highest city in Israel and Palestine. 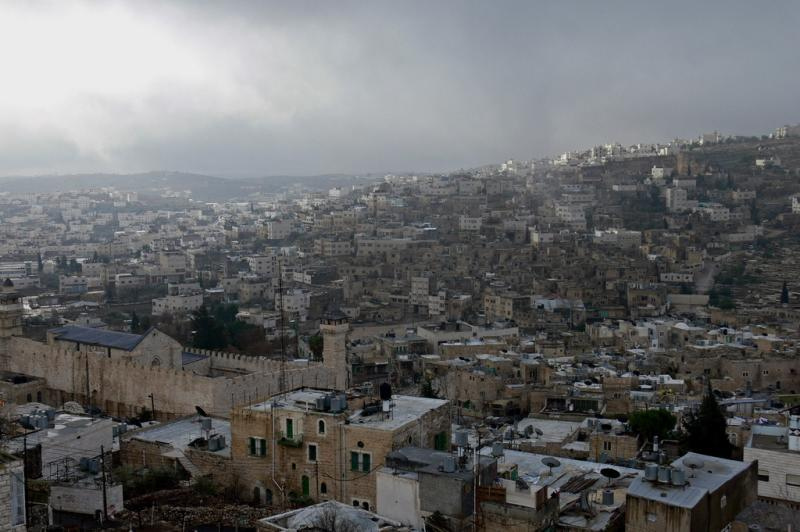 It is also the largest city in the West Bank, with a population in 2007 of around 165,000 Palestinians and several hundred Jewish settlers, and is known for its glassware and pottery. It was near Hebron that God made a covenant with Abraham, that he would be “the ancestor of a multitude of nations” (Genesis 17:4). Abraham had pitched his tent “by the oaks of Mamre” (Genesis 13:18), 3 kilometres north of Hebron, at a site now in the possession of a small community of Russian Orthodox monks and nuns. Here Abraham offered hospitality to three strangers, who told him his wife Sarah — then aged 90 — would have a son (Genesis 18:10-14). When Moses led the Israelites out of Egypt, about 700 years after Abraham, the men he sent to spy out the land of Canaan returned from the Hebron area with a cluster of grapes so heavy that two men carried it on a pole between them — an image that is now the logo of the Israel Ministry of Tourism. Later, King David ruled Judah from Hebron for seven and a half years before moving his capital to Jerusalem. Emulating Abraham’s hospitality, early Muslim rulers of Hebron provided free bread and lentils each day to pilgrims and the poor. 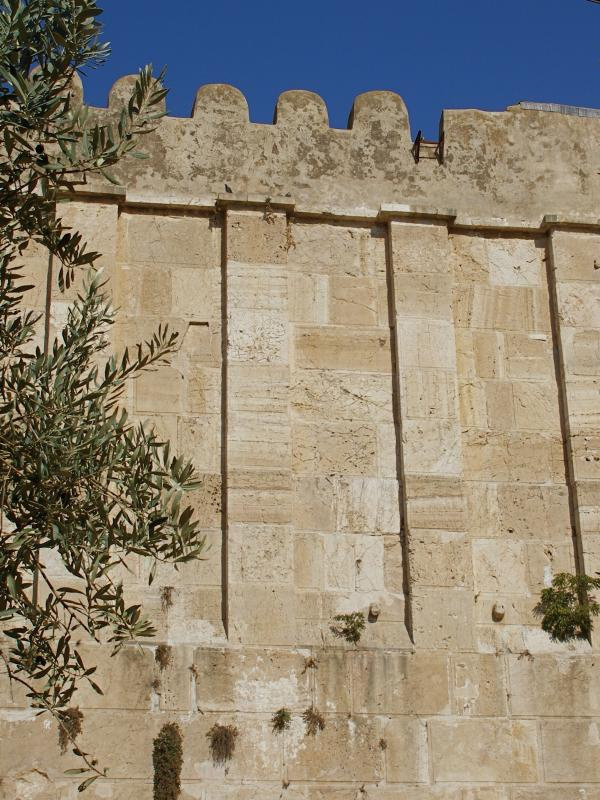 Herod’s mighty wall around the Tombs of the Patriarchs avoids the appearance of heaviness by clever visual deceptions. Each course of stone blocks is set back about 1.5 centimetres on the one below it, and the upper margin is wider than the others. The corners of the edifice — called Haram al-Khalil (Shrine of the Friend [of God]) in Arabic — are oriented to the four points of the compass. Inside, amid a confusing mix of minarets, domes, arches, columns and corridors of various styles and periods, the complex is divided into three main sections, each with the cenotaphs of a patriarch and his wife. 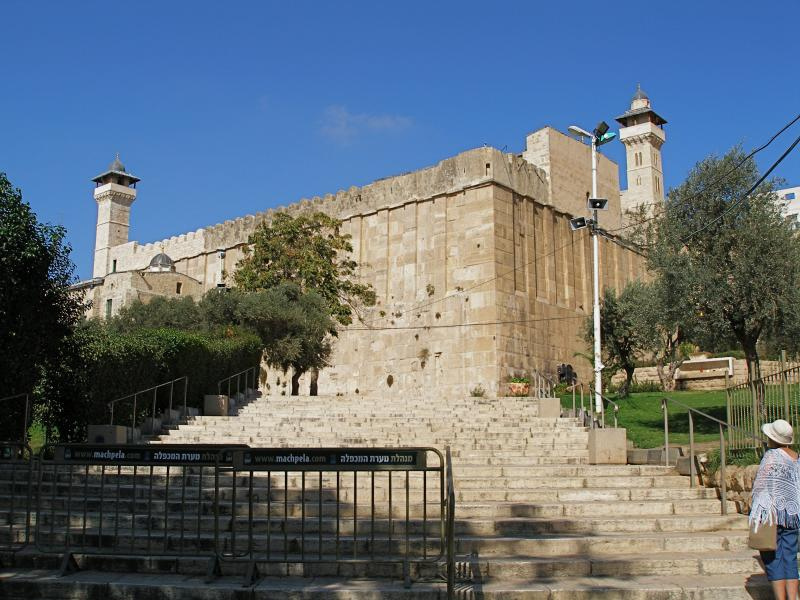 The main entrance, to the Muslim area, is up a long flight of steps beside the northwest Herodian wall, then east through the Djaouliyeh mosque (added outside the wall in the 14th century) and right to enter the enclosure. Straight ahead, in the centre of the complex, are octagonal rooms containing the cenotaph of Sarah and, further on, the cenotaph of Abraham. 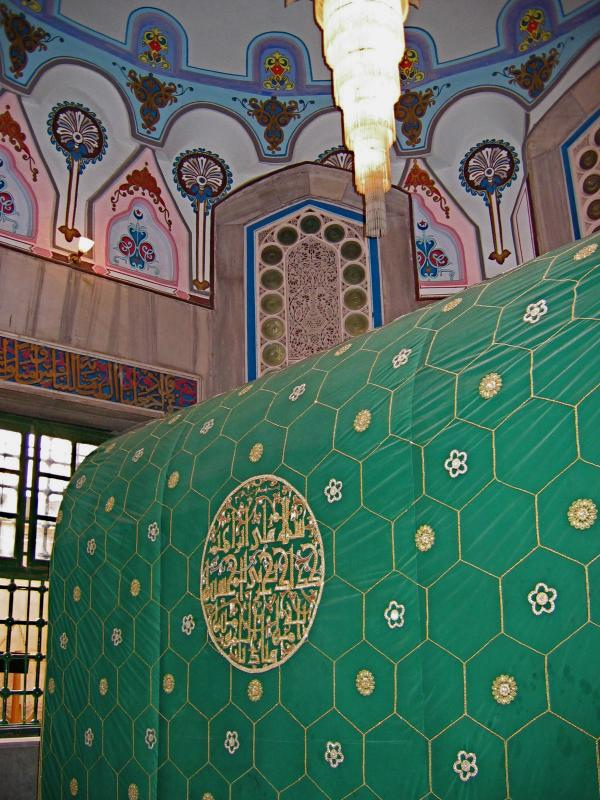 Each of these domed monuments has a richly embroidered cover, light green for Sarah and darker green for Abraham. In a corner just past Abraham’s room, a shrine displays a stone said to bear a footprint left by Adam as he left the Garden of Eden. 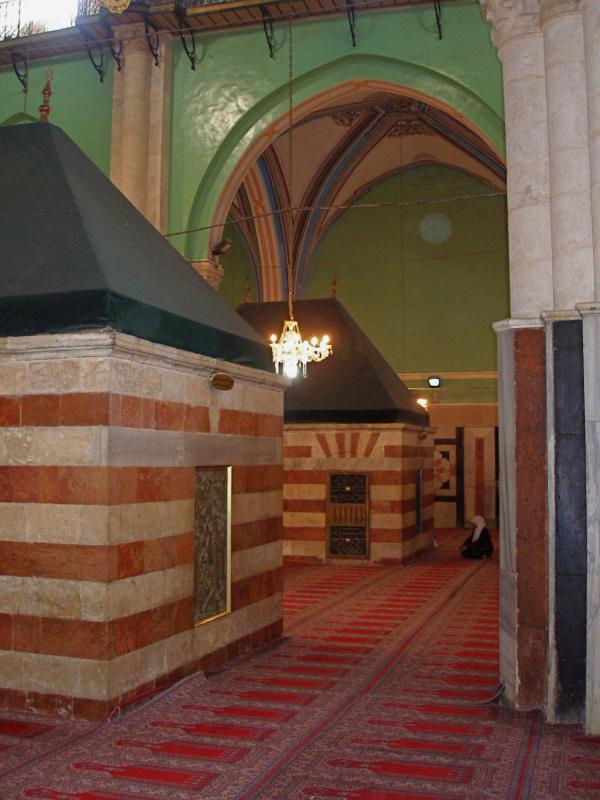 A wide door between these two cenotaphs leads to the Great Mosque, containing the cenotaphs of Isaac (on the right) and Rebekah. The vaulted ceiling, supporting pillars, capitals and upper stained-glass windows are from the Crusader church. 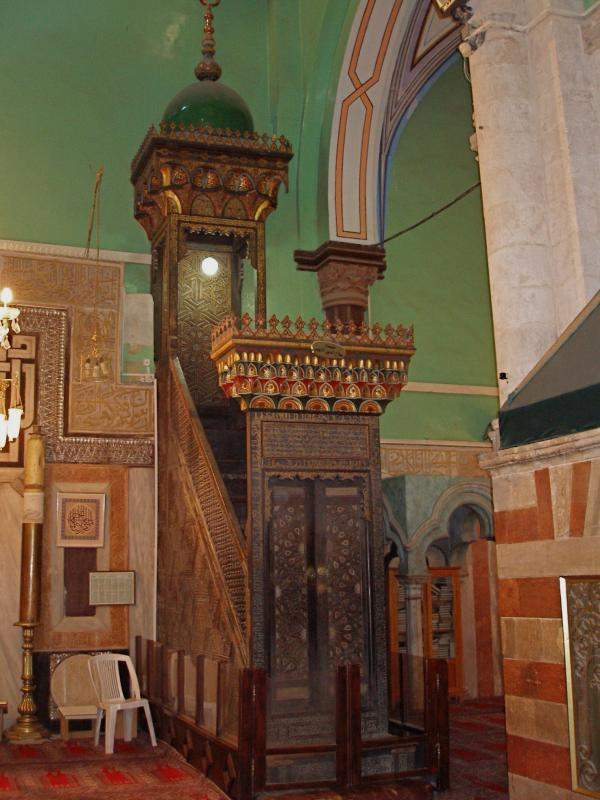 Ahead, on the southeastern wall, a marble-and-mosaic mihrab (prayer niche) faces Mecca. Beside it on the right is an exquisitely carved minbar (pulpit) of walnut wood. It was made (without nails) in 1091 for a mosque in Ashkelon and brought to Hebron a century later by Saladin after he burned that city. 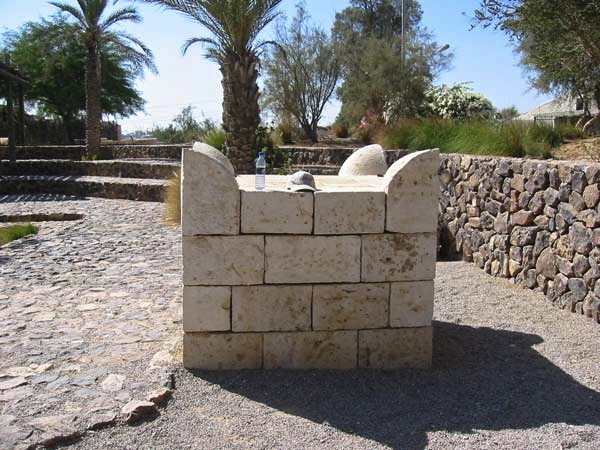 Next to the pulpit, a stone canopy covers the sealed entrance to steps descending to the burial Cave of Machpelah. Directly across the room, another canopy stands over a decorative grate covering a narrow shaft to the cave. Written prayers may be dropped down the shaft. Entry to the Jewish area is via an external square building on the southwestern wall. This building houses a Muslim cenotaph of Joseph, one of Jacob’s sons (though Jews and Christians believe he was buried near Nablus). Inside are synagogues and the cenotaphs of Jacob and Leah, each in an octagonal room. (Jacob’s beloved second wife, Rachel, is remembered at the Tomb of Rachel, on the Jerusalem-Hebron road north of Bethlehem). Friction between Jews and Muslims at Hebron dates back to a 1929 riot in which Arab Muslims sacked the Jewish quarter and massacred 67 of its community. 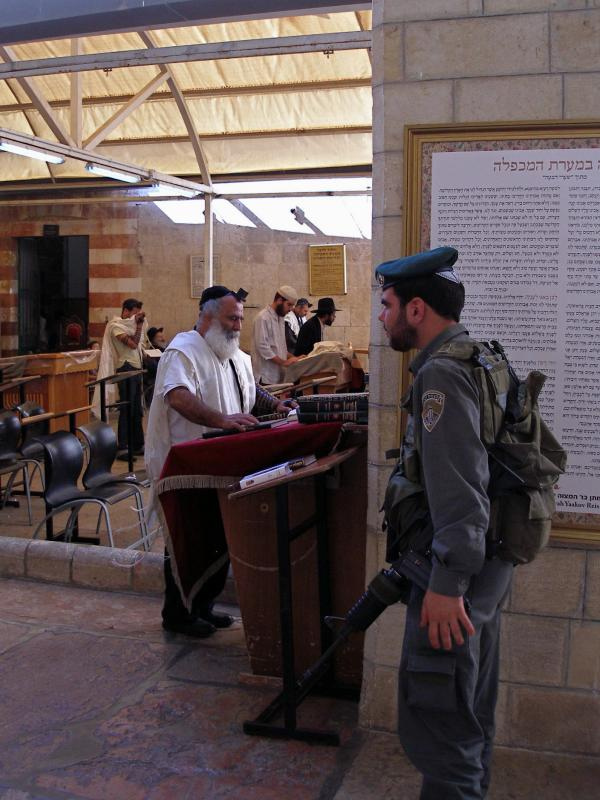 More recently, in 1994 a Jewish settler entered the Tombs of the Patriarchs during dawn prayers and shot 29 Muslim worshippers (the mihrab still bears bullet marks). Since then, Jews and Muslims have been restricted to their own areas of this divided site, except that each faith has 10 special days a year on which its members may enter all parts of the building. Pilgrims and tourists may enter both areas. The city of Hebron is also divided into two zones. The larger part is governed by the Palestinian Authority. The remainder, including the town centre and market area, is occupied by Jewish settlers and under Israeli military control. Open: Usually 7.30-11.30am, 1-2.30pm, 3.30-5pm; Muslim area closed on Fridays, Jewish area closed on Saturdays. Passport checks apply and it is wise to check the security situation before visiting (the Christian Information Centre in Jerusalem suggests telephoning 02-2227992).